Denial is a hard thing, especially as a parent. As much as we want our children to stay little and innocent, they inevitably grow up. No matter how many times I have asked both of my boys to slow down, they seem to be growing in leaps and bounds. I admit it, I want my little boys to stay just the way they are. I love that NHL is exploring the world around him, anxious to learn to read and write, talking about video games with Daddy, and learning to love chapter books. 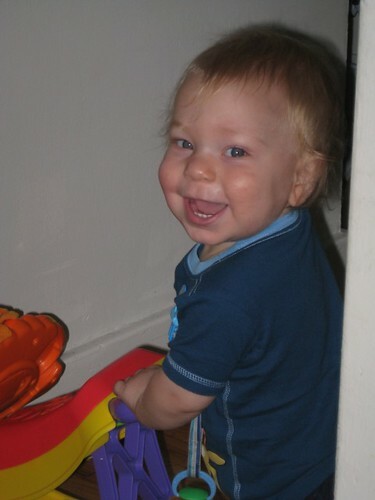 What I am in denial about is that my baby, yes he technically will always be my baby, is hardly a little boy anymore. Before my eyes my little boy of four has morphed into an almost five year old boy who will be off to kindergarten this fall. I am in major denial that my little boy, my first born is old enough to be in "real" school. The reality partially hit Thursday which was NHL’s last day of nursery school. It came at me quickly and right between the eyes. This is the last summer before my little man goes to school and has homework, before our lives as a family will really change. I feel like I lost so much time with him when I went to work for three precious years of his life . . . time I will never get back. Thanks to this guilt I am going to try to make this a great summer for NHL. I want to make sure he has fun, gets to be a kid, and most importantly does not have time to worry about kindergarten. My poor little guy is a worrier and change of schools is upsetting to him. NHL: "Mommy I want it to stay June." NHL: "I don’t want to leave my school"
That tugged at my heart. I so wish I could have stopped time for my baby and let him stay in the place that helped to make him believe in school again after the horrid start in the fall.Unfortunately, I can not push the pause button and before I know it September will be here. I just pray that things go well. I really fear that another bad start could ruin NHL’s desire to learn and he has so much potential and is thirsty for knowledge. What I am not going into now is a phone call from NHL’s kindergarten teacher for the fall. I cried on Friday after the conversation and was beyond upset. Heck, I have tears in my eyes now. I really hope that my first impression (over the phone) is wrong and we will not have any issues, but I guess I am quite pessimistic after the start at the other school in the district back in September. I truly hope I am making something out of nothing. More on the denial front is that my baby technically is not a baby anymore. JSL is a toddler now, although he will always be my baby like his big brother. This week JSL has learned so much and had so many milestones. His first molar FINALLY popped up during a nap one afternoon. Now the poor little guy has three more of those and the four canine teeth to work on. Words keep flying from JSL’s mouth. If he wants something he now has words to use for many. A favorite is "Wah-wah" for water. Saturday night while out with family friends and my parents, JSL wanted my mother. He knew that we were all leaving and he said "Nana go bye-bye" while waving to her. Then as he saw her move away from her he started to cry and throw his body to her. Temper tantrums are another big milestone. When he does not get something he wants JSL has learned to use his voice to show discontent. Not only does the little guy scream, but he will also stomp if standing and jump up and down. JSL will throw his body at the object he wants and hoot and holler hoping to get the item of desire. The other night while NHL and JL were playing Mario Kart on the Wii, JSL decided he wanted to play and/or get NHL’s new hair brush. Neither of these was an option and we had our first real temper tantrum. I sat there watching all of his antics. I was a bad mommy – I laughed so hard I had tears coming out of my eyes. It was just too much seeing such a little person make such a fuss. JSL is also very close to walking on his own. He lets go of items for long periods of time and is starting to walk holding onto the wall, letting go and thinking about taking more steps. We all are curious to see if those first solo steps may come at Uncle I and Aunt M’s house since that is where NHL finally walked on his own. Perhaps it will be a tradition – update to come soon. I guess I need to get used to milestones coming and going with both of the boys. I can not imagine how much of a mess I will be in Setpember, no less on JSL’s last day of nursery school in four short years. Will watching my boys grow and become more independent ever get easier? 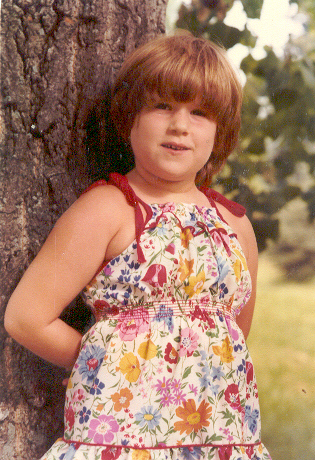 BTW – Here is a photo of me the summer before I went to kindergarten. *sigh* That growing up part is so tough. You’re excited to see them developing so well and learning new things, but at the same time…they’ll always be that little baby. I pray everything goes well for him this next school year. They do grow so fast! Just in the months since I started reading your blog I can see how much both NHL and JSL have grown up. Before you know it they’ll be in high school and then married and having families of their own (which makes you a GRANDMOTHER hehehe!). I know, you want to kill me. Cute picture of you, by the way! Love your pre-kindergarten photo! And, no, I don’t think it ever gets easier! UGH! And can you believe the tantrums start so early? Us too! AHHHH!